Super Bowl LIII will pit the Los Angeles Rams against the New England Patriots, but the sidelines will be the setting for another kind of matchup: youth versus experience. In 2017, Sean McVay, at 30 years old, was the youngest head coach to be hired in NFL history. Now in his second season, he’ll be facing off against Bill Belichick, the league’s longest tenured head coach. As a leadership professor, I study how leaders of all ages navigate generational differences, including how to motivate those that might be on the other side of the generation gap. For Belichick and McVay, the challenges might seem particularly acute. Most of Belichick’s players hadn’t even been born when Belichick secured his first coaching gig. 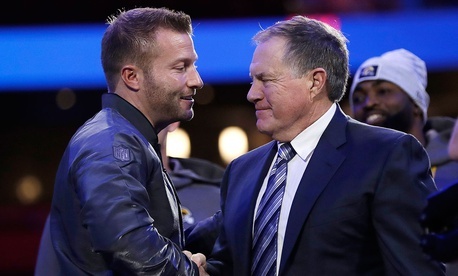 And while McVay can probably talk about social media with his players in a way Belichick can’t, he’s in charge of a coaching staff that includes septuagenarians. But it doesn’t matter if you’re the greenest of leaders or a grizzled veteran: With some insight into generational dynamics, your age can become irrelevant. Having a leader at one end of the age spectrum can lead to all kinds of assumptions. Research has shown that older leaders are expected to be stable, dependable and interested in upholding the status quo. Younger leaders are thought to be natural change agents and innovators. There seems to be a basis for these assumptions. Studies have found older leaders do tend to take a more measured approach and lead in ways that are described as structured and conservative. Younger leaders, in contrast, are more energetic and have what employees describe as a “take charge” approach. But one approach isn’t necessarily better than the other. Instead, what matters is the ability of a leader, young or old, to do two things. First, they must reflect certain leadership qualities. Research shows that people want leaders who they see as inspiring, competent, forward-looking and honest. For example, a young employee and an older employee might interpret the same action differently. While boomers tend to interpret a lack of feedback as a sign that everything is going well, millennials may assume the opposite. Studies show that they expect a steady stream of feedback and mentoring. We also know that millennials place a lot of weight on how well a leader communicates and connects with them on a personal level, which makes them feel valued. Boomers also want to feel valued, but asking them what they did over the weekend isn’t the way to do it. Instead, a boss could ask them to offer advice or input. The Rams aren’t the only organization giving the keys to a young leader: Across many industries, the number of millennial bosses is rising. Those born between 1981 and 1996 now make up 20 percent of organizational leadership roles. Baby boomers like the 66-year-old Bill Belichick currently hold just 18 percent of these roles. Baby boomers may appreciate the energy and communication skills of younger leaders. But in order to gain the trust of older employees, young leaders often need to be willing to openly acknowledge what they don’t know yet, and ask others for input. McVay appears eager to do just this. When asked what it means to have the older, more experienced Wade Phillips as his defensive coordinator, McVay described it as a “yin and yang” dynamic. Older leaders need to grapple with a different set of challenges when engaging younger members of their team. Established leaders such as Belichick grew up in an age when holding positions of leadership meant unquestioned respect. But younger generations are less inclined to listen to someone simply because they hold a title. Nonetheless, older leaders are still well positioned to connect with younger employees who are eager for guidance, and their years of experience make them effective mentors. They also tend to bring a calm and consensus-building approach. Just as important is an older leader’s openness to the ideas of their young employees. It signals that they’re confident enough in their own experience and track record to empower those beneath them. According to his coaching staff, what makes Belichick such an effective leader is his willingness to listen to and trust his staff. Success, whether in the boardroom or on the field, depends on the talent of a leader to understand and navigate the expectations and needs of all their team members – no matter their age. For a leader in today’s 21st-century workplace, that may be the most important playbook of all.